One of the most common factors of stress, besides financial worry and problems in the workplace, is family difficulties. We have all, at some time or other, experienced a scenario where there has been a family crisis, be it bereavement, illness or the break up of the family unit.Stress within the family unit can bring the family to a stand still or result in the break up of an otherwise stable household. Mothers and fathers often find themselves suffering prolonged periods of stress as a result of the children’s actions. Sometimes a child may play truant from school or have gotten involved with other children who are a bad influence on them. These are things that bring additional worry to the parents who are perhaps already struggling with financial burdens, problems at work, illness or even problems with their own relationship. Children are also prone to high levels of stress especially if the parents are experiencing problems in their own relationship or indeed if they split up. The break up of a marriage can be a very stressful time for the family as a whole, not just the parents, and it is important to remember this. It is also important to remember that stress not only affects the sufferer but it also can affect the moods and attitudes of those around them. If a wife and children are witness to their husband and father suffering extreme levels of stress, due to pressures of work or financial difficulties, it can have an overwhelming effect on their behaviour as well. Irrespective of which family member is suffering from the effects of stress it will have a knock on effect to all those around them. Many families operate on the principle that if there is a problem within the family then it is the responsibility of the parents to resolve it. This in itself is stressful for no other reason than the fact there is the extra burden of trying to keep certain circumstances and details from the children. This characteristic in many families increases stress levels and ultimately brings about stress for those not privy to what is actually going on. Children in particular are very susceptible to the mood swings of others around them and this can be no more evident than in the family home. Stress causes families to compartmentalise and in some instances depending on the nature of the problem that brings about the onset of stress can cause family loyalties to shift. Avoiding any type of stress within the family unit is difficult if not impossible but it can be reduced. Parents should spend the time talking to their children about the issues that are likely to affect the family as a whole, after all financial difficulties or the loss of a job will undoubtedly have an impact on the family as a whole so it is wise to talk these issues through in a calm and civilised manner. Also, in today’s lateral thinking world, it is often commonplace for children to be more aware of what is going around them through schooling and the media than many parents might like to give them credit for. If stress is something that is affecting your family there are some simple steps you can take to minimise the damage caused. 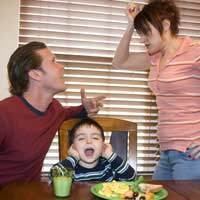 Don’t argue in front of the children, this only upsets them and in turn inflames tempers in those who are arguing. Don’t keep worries of financial hardship a secret; talk them through as a family and make sure everyone understands the significance of what they are being told. Make time for the family as a whole; spend time together. This can be anything from watching television together, sitting down for a meal together or going for walks. In the absence of spare cash, which most families experience at one time or other, it does not mean that the family cannot do things together. There are many pastimes families can engage in together without it costing the earth. If your stress is affecting your moods or your health visit your doctor and ask his or her advice; sometimes dealing with stress can be more pro-active than reactive.